We have arrived at Sarasijhaa and Salman’s beautiful fusion wedding ceremony! The next day our bride and groom had all their loved ones celebrating their love at the Legacy Acres - Arkansas’ sweet wedding chapel. This unique spot helped the expert wedding firm Eminent Planning to create a heavenly setting including big arrays with large bold flowers that really blew my mind! 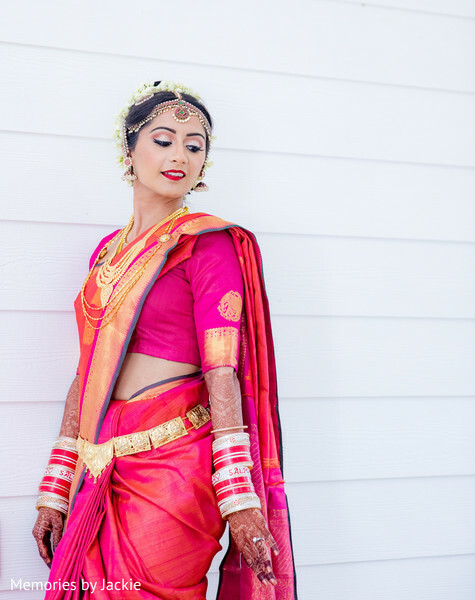 Traditional and classy, Maharani Sarasijhaa was ready to walk down the aisle and made everyone’s head turn with her elegant fuchsia silk saree and mesmerizing floral hairstyle by McKayla at Harrington & Company while her lovely bridal party also flaunted jasmine florals on their hairdos that flawlessly completed their lovely sarees! 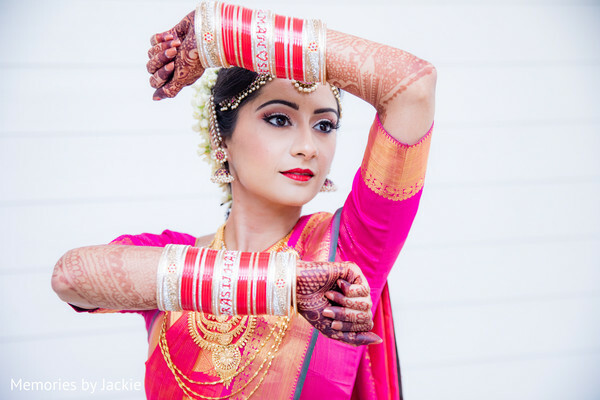 The beautiful bride was carried out to see her Raja Salman’ baraat that was enlivened by nobody else than DJ Riz Entertainment’s exciting Bollywood music! 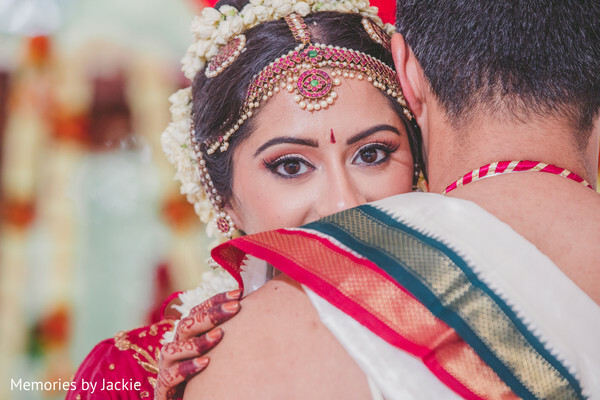 Memories by Jackie was there to capture all the ceremony action and best moments to remember which you can find in our complete gallery! The story of Sal and I started with a ridiculous amount of chemistry —CHEM101 that is. In the spring of our freshman year at the University of Pennsylvania we bonded (pun intended) over our beginner chemistry class, and not too long afterward, developed a slightly more exciting chemistry together. 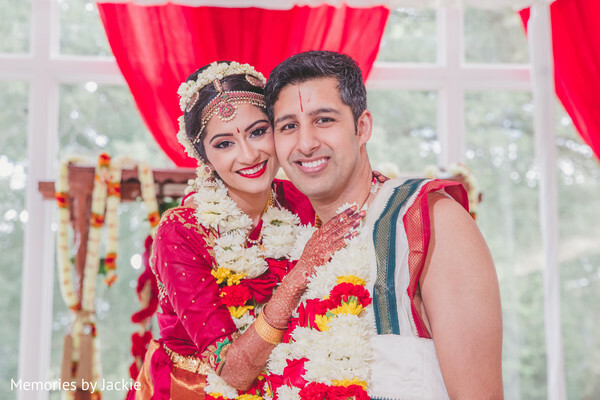 After much consideration, we made the decision that religion (Sal is Ismaili and I am Hindu) was too big to overcome and went our separate ways to medical and business school. Sal and I stayed in touch through the years. By coincidence (some would say fate) we ended up in the same cities for my away rotation and his internship. While our run-ins were infrequent, they kept us connected, and our friendship stood the test of time. Much to my surprise, Sal called me not too long afterward and said he was coming to Seattle “on business.” We had tough conversations but came to the realization that though our religions were different, our morals and goals were the same. We also came to the conclusion that love should and could not be limited by religion. The rest is history, but we can truly say that our relationship has been built on years of friendship and support. We were there for each other through exciting and trying times, so it only seemed natural when chemistry once again appeared. Our relationship has continued to grow and we are unbelievably excited to begin this new journey. Sal and I spent two years in a long distance relationship with him in Dallas and me in Seattle. Both of us value and love our families tremendously, so when we started having conversations about our future, we knew that we wanted our extended families to meet. We arranged to have our families gather during a weekend in Arkansas. Little did I know that Sal had more planned. I was supposed to take a Friday evening flight out of Seattle. I was on my way home to pick up my suitcase when my attending called and said there was an emergent case going to the operating room. Though I was not on call, I knew that it was a unique case, so I called Sal and asked him to delay my flight. He obliged. Thinking back on it, I can’t believe how calm and supportive he was of my career despite all of his weekend plans and the potential that I wouldn’t make it home in time. The case went well but took some time. I drove straight to the airport without anything I needed for the weekend and boarded the red-eye flight. I landed in Little Rock the next morning. My sister drove me to my parents’ house for lunch. When we got to my street, my dad and niece were standing at the corner with a tiger lily (my favorite flower) in their hands. I got out of the car and saw both our families spread out along the street with flowers in hand. Each set walked me a little farther down the street telling me how much they loved us and recounting funny and emotional stories. I literally laughed uncontrollably at some points and cried at others. My mother was at the front door and led me inside the house where there was a pathway of petals leading to our back porch. When I stepped out onto the porch, I was greeted by Sal as well as a pianist and violinist playing our favorite song! Sal proposed and we spent the rest of the weekend celebrating with our families. It’s crazy to think that, had things gone slightly different, I may not have made it to one of the most important weekends in my life! Sal and I incorporated a lot of our families’ traditions in our wedding but had the most fun planning the less traditional aspects. We realized that we would have all of our loved ones in one place for an entire weekend just to celebrate us! This made us think about how amazing it would be if we could spend at least part of the weekend giving back instead of focusing on ourselves. 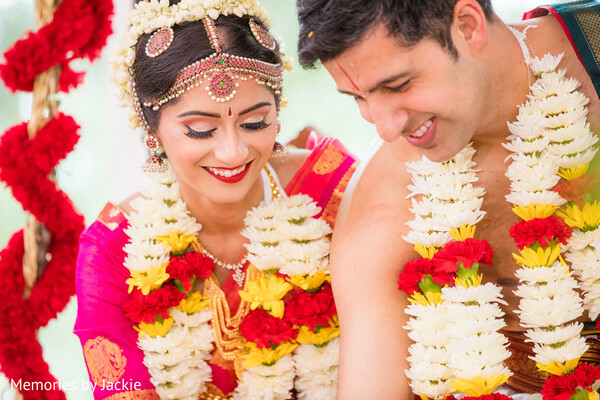 We decided to add a service/seva event to kick off our wedding. This was probably the most rewarding part of the weekend. Our family and friends ended up making 20 prosthetic arms for people around the world who have lost limbs in tragic accidents. The event couldn’t have been filled with more love. We also added a twist to a few wedding traditions. 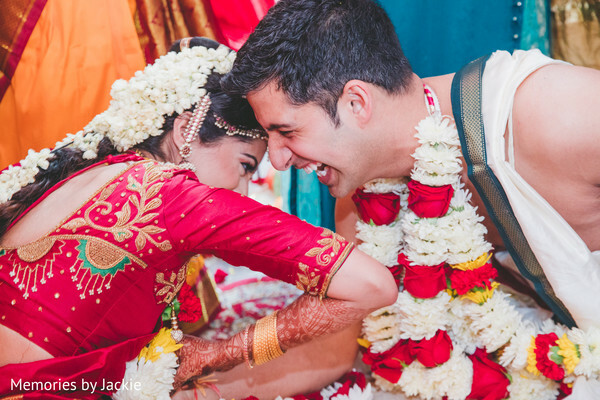 We both love to dance, so instead of waiting at the chapel, I was carried out in a Doli to meet his Baraat and join the dancing! We also came out first at our reception so that we could announce our family and bridal party. This meant a lot to us because they made the weekend come together. 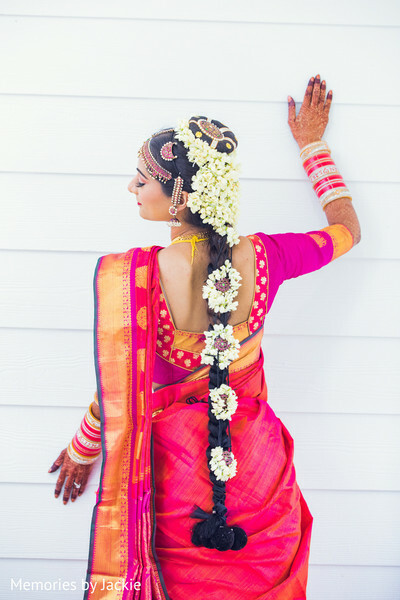 I think that planning and looking forward to these unique events and moments was what kept wedding planning fun and exciting for us. Sal and I are different religions. 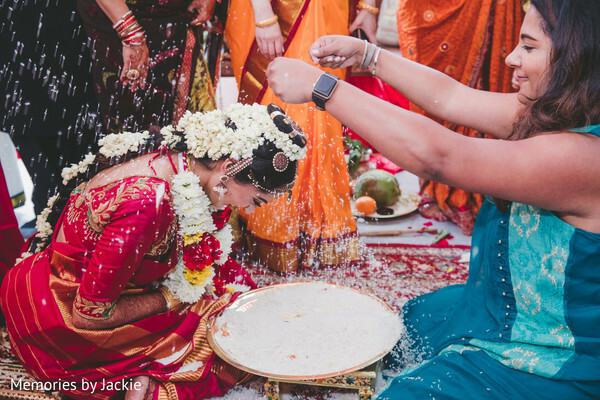 We really wanted to incorporate both our families’ traditions and share them with our friends in a fun-filled and high energy way. 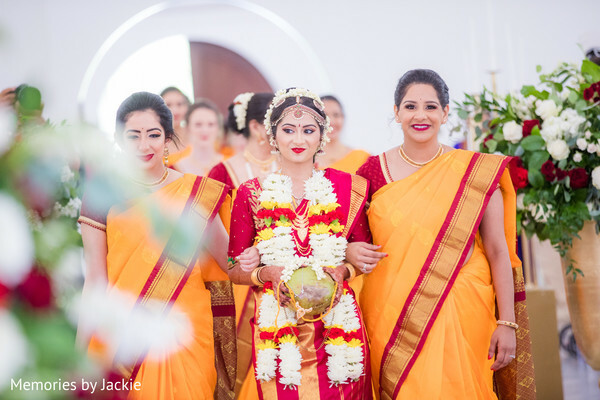 I think our guests enjoyed experiencing all of the unique traditions and seeing them come together. One of our friends posted on social media that our wedding displayed, “profound respect for one another’s faiths, beautiful decorations, and a couple head over heels in love with one another. God is too big to fit into one religion, and so is love.” This meant so much to us. The moment that most replays in my mind is the very end of our Pithi / Sangeet. As the night drew towards a close, the DJ announced he was playing the last song, and then proceeded to play the most perfect song imaginable -- Marry You by Bruno Mars. It was fitting because while the night was ending, the very next event (the following morning) was our wedding! Sal and I found each other on the dance floor, and just got totally lost in dancing to the song together. 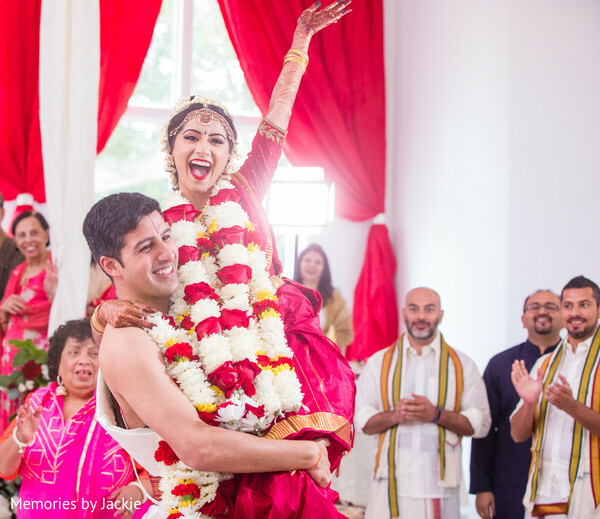 The energy we had in those moments, the energy of our friends and family around us as they danced along with us and celebrated the song and our forthcoming marriage, was indescribable. For as long as I live, I cannot imagine having more fun dancing to a song that I had dancing to "Marry You" that night. While the entire weekend was perfect and amazing in so many ways, that moment stands out. We certainly can’t wait to see all the grandeur of the reception! Follow our next feature! DJ Riz Entertainment and Memories by Jackie are members of the Platinum Guide. Love what you see? Explore their portfolios.